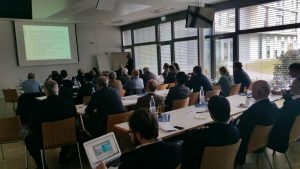 Exploring the latest scientific information on natural orifice surgery the Frankfurt 2017 EURO-NOTES meeting brought together leaders from around the world to discuss past present and future of Natural Orifice Translumenal Endoscopic Surgery. Cutting edge techniques such as Peroral Endoscopic Myotomy and submucosal tunnelling techniques, Endoscopic Submucosal Dissection and full-thickness resection, hybrid percutaneous and endo-laparoscopic approaches, were presented as a natural evolution of current surgical practice. EURO-NOTES 2017 highlighted once again that the boundaries between surgery and endoscopy get narrower every day. NOTES procedures may not be the standard of care today but NOTES technology heritage and philosophy penetrated and influenced our current practice bringing innovative thinking and innovation in our theatres. “No scar’ surgery opened the way for surgeons to using flexible endoscopy to treat GI diseases, internalizing surgical access and bringing the surgeon much closer to the pathology. EURO-NOTES 2017 left us with the clear message that modern digestive surgery needs leaders with endoscopic skills that are well defined, and that we need to educate ourselves and formally train our residents preparing for this change under the auspices of EAES and world leading surgical societies. Session 1 – Current standing; What is NOTES today?